The best juices, to me, are vegetable juices that taste good. This apple cucumber kale juice is just that. It is a refreshing, cool, and mild green juice that features the cucumber and lemon as it’s main flavors. Not only will you enjoy drinking this green juice, but you will also be happy to know you’re receiving over 900 milligrams of potassium, 21% of your daily vitamin B-6, 197% of your daily vitamin C, over 300% of your daily vitamin A as well as many minerals! Start by thoroughly washing your apple, kale leaves and english cucumber. I also washed off the lemon to ensure there was no dirt on the rind that might get into the juice. Cut your apple and cucumber into smaller pieces that your juicer will be able to process. Also cut your lemon in half and remove most of the rind but leave on as much of the white part as you can. I did this because the rind will be tough on the juicer. For the kale, I used most of the whole leaf, except for the bottom part of the leaf where the stem becomes very thick. I didn’t juice the thickest part of the stem because it’s hard for my juicer to process. Now you’re all set to start juicing. Start by putting your half of a lemon in your juicer followed by some apple and cucumber chunks. Then add in some of your kale and follow with the apple and cucumber chunks to help the juicer to push through as much of that kale juice as possible. Continue this way adding in some kale followed by the apple and cucumber until everything has been juiced. Once done juicing, pour into a glass and serve immediately. Enjoy your apple cucumber kale juice! 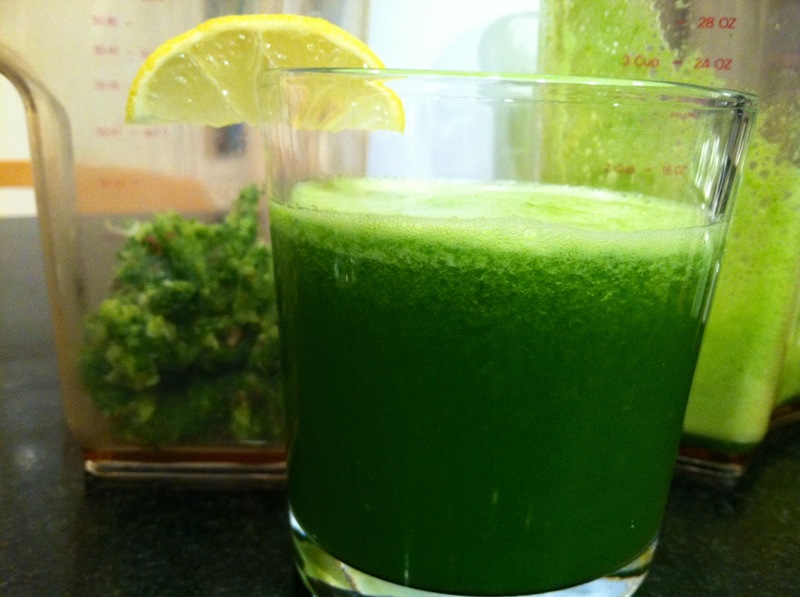 This apple cucumber kale juice will give you 167 calories and 42 grams of carbohydrates. It will also give you 966 milligrams of potassium and 5 grams of protein. In terms of vitamins, you’ll be receiving 8% of your daily vitamin E, 21% of your daily vitamin B-6, 197% of your daily vitamin C, and over 300% of your daily vitamin A. 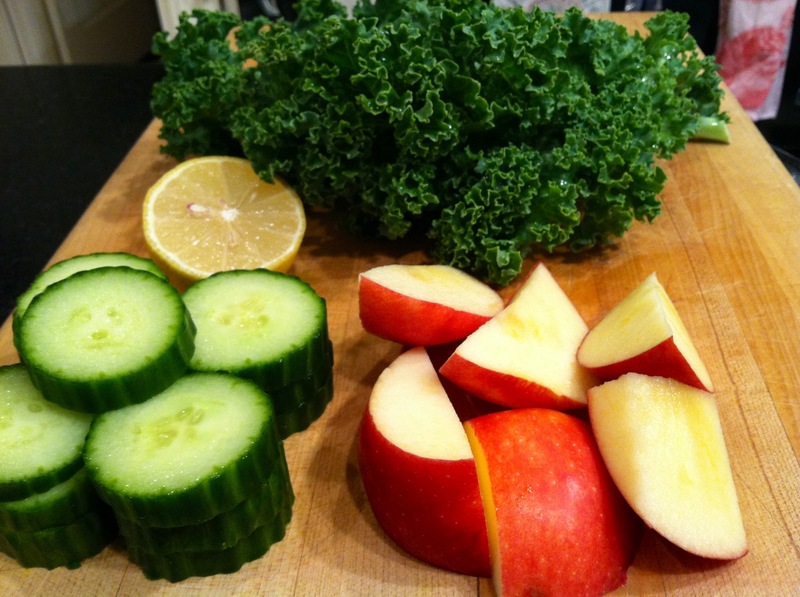 One serving of this apple cucumber kale juice will also provide you with a variety of minerals. Some of those include, but are not limited to: 14% of your daily iron, 15% of your daily folate, 17% of your daily calcium, and 25% of your daily copper. I just made this, and I love it! So glad you enjoyed it! Thanks for checking out my recipe! This was absolutely delicious. I’m definitely using this for future juicing. Thanks.